Gorgeous in White Platinum, our 2017 Ford Edge Sport AWD will make you fall in love with driving all over again! Powered by a TurboCharged 2.7 Litre EcoBoost V6 that offers 315hp while connected to a 6 Speed Automatic transmission for spirited driving. This All Wheel Drive feels robust and sporty with adaptive steering, torque vectoring control, and a sport-tuned suspension all while offering near 9.8 L/100km. This SUV delivers an optimal blend of efficiency, utility, and fun behind the wheel. 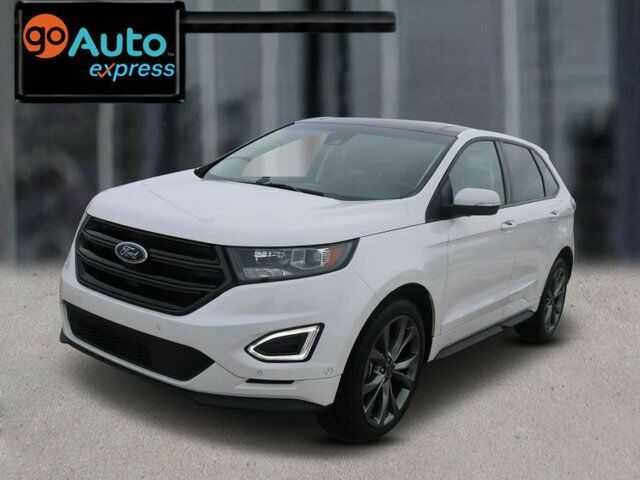 Dare to turn heads in our Edge Sport that boasts ample cargo space and expansive head and legroom for five passengers while retaining bold style with its unique wheels, dual exhaust tips, and distinct grille. Settle into heated/cooled perforated leather and suede seats and enjoy high-tech, modern design featuring Sync 3 infotainment with a prominent touchscreen and Sony premium audio with available satellite radio. Keyless ignition/entry, a hands-free liftgate, a sunroof, ambient lighting, an auto-dimming rearview mirror, full-color navigation, and a 60/40 split back seat are just a sampling of amenities that help to make our Edge a consumer favorite. Drive with confidence knowing automatic headlights, a rearview camera, rear parking sensors, advanced airbags, traction/stability control, Curve Control, and emergency crash notification are all on board to help you avoid and manage challenging driving situations. You'll even have peace of mind thanks to MyKey, which allows you to set controls for the teen driver in the house! This is the perfect midsize crossover for the on-the-go family. Print this page and call us Now... We Know You Will Enjoy Your Test Drive Towards Ownership! Vehicle has a $3,682.00 carprrof claim. AMVIC Licensed Dealer.